The crash happened on Great Northern Road in Aberdeen on Thursday morning. 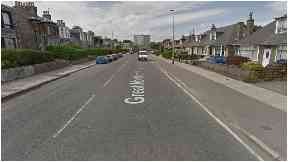 A child has been struck by a vehicle in Aberdeen city centre on Thursday morning. The collision happened on Great Northern Road, near Leslie Road, during rush hour on Thursday morning next to a primary school. Police and ambulance services arrived at the scene after the alarm was raised at around 9.05am and the child was taken to hospital. A spokesperson for Police Scotland confirmed the driver of the vehicle stopped to assist officers with their enquiries.